« Getting ready for winter… by baking blueberry muffins! 27 Comments on Oldies are Goodies, But Freebies are Oh So Sweet! I asked this over on DSD but I’m not sure if you checked the thread or not. First of all, thank you so much for making this pattern available! I can’t wait to try it. I was wondering if you used Warm & Natural batting for the soaker? That’s what it looked like in the picture, but it’s hard to tell. It’s Warm & Natural batting 🙂 It’s my newest addiction for inner soaker layers! Oh, great! I love that stuff but was never sure if it was suitable for diapers. 🙂 Thanks again! I am new to this cloth diapering thing, but these look really cute! Do they have any waterproof material in them? Could you add it? If so, where? Thanks! how many layers of warm & natural did you use? and should I wash it first? i have some scraps lying around from a quilt i made and thought they’d be perfect for the newborn size. I have a light wetter/ec’er so I use about 3-4 I would suggest more like 5-6 for regular wetters. No need to pre-wash! Thanks for putting this pattern online. 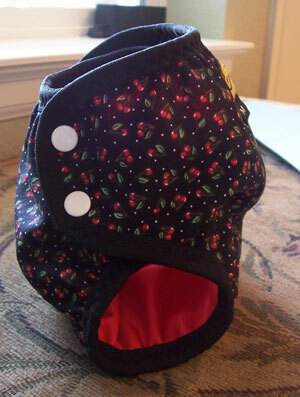 I am wondering how this diaper fits (other than the snaps on front flap vs back flap) in comparison to the little half moon pattern? Also, what is Warm and Natural batting?? thanks a lot! It’s a hip snapping, vs a side snapping diaper, meaning that there is less overlap in the parts where it fastens. Front and side snapping diapers tend to be more T shaped, whereas a hip snapping is more of an I shape (think serif font!). The Little Half Moon Diaper pattern is trimmer through the front and curvier out back. This is more of a regular balanced diaper, average fit. Warm and Natural batting is a brand name material that you use for the insides of quilts. Being 100% cotton, it’s absorbant and trim, and being a non woven, you don’t need to worry about finishing the edges as not to fray, http://www.warmcompany.com/wnpage.html. OOH! 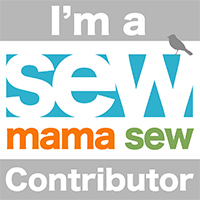 Now not only am I excited about sewing my first diapers (this and the TWH…wish me luck!) but I found out about Warm and Natural too. SWEET! Thanks! This looks like a great pattern and I can’t wait to try it! I had one quick question; how do you know how much elastic to cut? I can see by the picture that it is stretched to fit, but how do I know how much stretch it should have? so cute! I don’t have a snap press. Think I could use velcro ? thanks for your pattern. I made one of these for my daughter, it’s so cute. tahnks for sharing. Is seam allowance already added in this pattern? or would you add seam allowance while cutting? I tried making one today and failed miserably! Quick question on the TWHH pattern! I was reading over how you put the PUL to the inside on the AIO so we can show off our cute prints, and was wondering 1) if that technique will work with the TW and 2) if the PUL film will work for that or should the actual PUL fabric be used? Thanks so much for all the great info on your site! I was wondering what the suggested weights for each size are? I really want to try this but would like to make the right size the first time around. Thank you! Oh my! Thank you Thank you thank you! My lil girl is just outgrowing her dappi pants and I wanted some cute covers but . . .money is tight and I think home ec was the last time I sewed! I got out that sewing machine instr. book and kept up the pic link and wow! First try got an amazing diaper!!! I can’t wait to get some real material (not t-shirts and towels that I practiced on) and make some covers now that i know I can! I’m in the process of making some trainers for my son. Would these work for that or is it necessray to have a waterproof outer? I love this pattern! 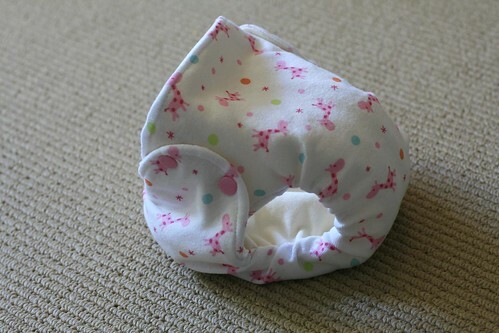 I’ve only made one diaper so far, but it fits so trimly that I can’t wait to make a billion more!